Sketches for the month while hanging in the wild, except the couple noted. The view from one of the wind caves in Gaviota State Park. A climbing wall in Rattlesnake Canyon. View of the layers of mountains from along the Rattlesnake connector, almost to Tunnel trail. 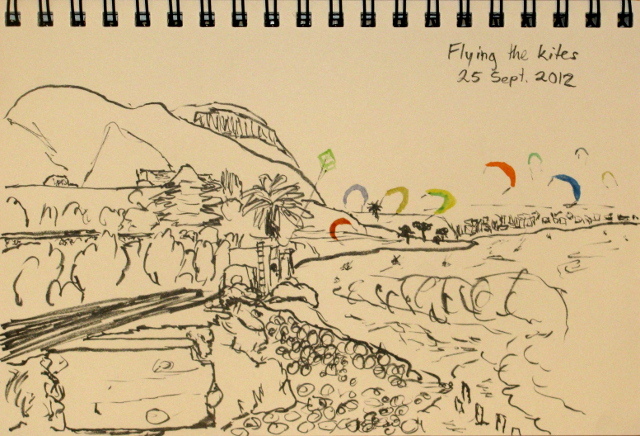 Stopping along the 1 "north" of Ventura and looking back along the coast on a blustery good day for kite boarding. 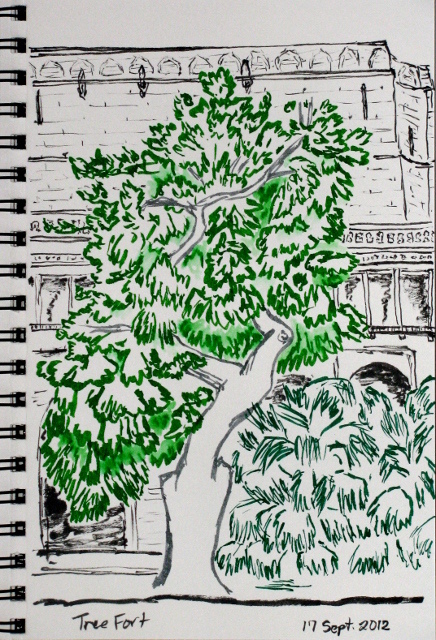 A redwood at the Santa Barbara Museum of Natural History that helped keep some at the Art Walk cool. Sketching materials are generally some pens and a book of paper that isn't too horrible. Unfortunately, I don't really want anything to do with a ball point pen. Fountain pens are now my preferred writing tool, especially Pilots, but they are new things for me and I still haven't gotten to trying to sketch with them. I had a halting attempt at a dip pen, which supposedly give a very responsive line, but trying to find a good ink well for traveling has come up with nothing. There are various pastels and even crayons and felt tipped markers of various sorts, all not quite what I want when I am sketching. What I really like is the brush. Nothing is more responsive. Most people seem to find them too responsive and so refer to this as "fidgety" instead. Drawing a brush across a page can lead to surprises, but I love the surprises. Well, most of them, anyway. I learned that there are brush pens that actually have bristles on the end. Not markers with long, soft felt tips that get called "brush pens" but actual pens that have brushes as the nib. 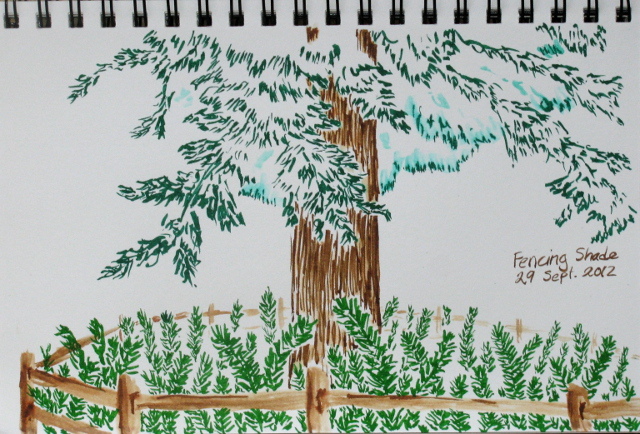 Unfortunately, the Pentel Pocket Brush Pen was not actually sold on my side of the Pacific Ocean. 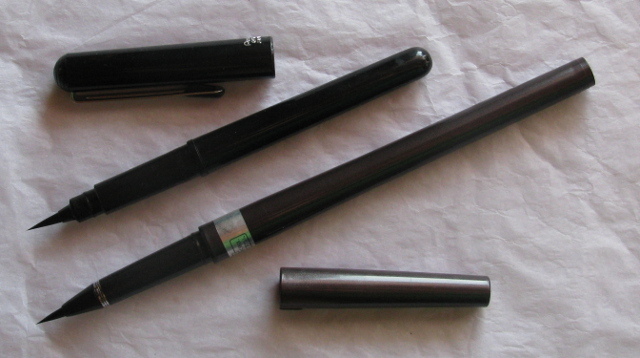 Nor were a few other brands of brush pen, but the Pentel Color Brush could be found at the local art store. 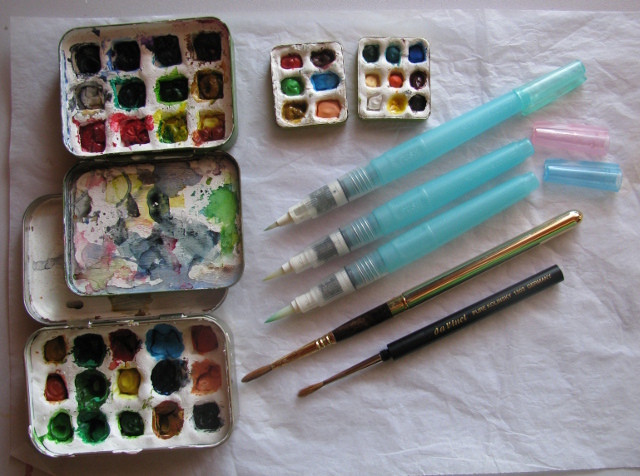 This is not the same as it is constructed to hold more like a fat brush than a pen and is filled with watercolor instead of ink. The brush on the end is much larger, as well, not that I would know until holding both of them myself. I picked one up in sepia (top brush) at the local art store and actually first used it on a watercolor block on a chilly and windy fall morning. It worked beautifully on there, so long as I only really wanted one value of sepia for my picture. The pigment is rather more concentrated than is generally desirable and the result is water soluble, as advertised. The brush is a bit larger than I really wanted. They generally do not leak badly, but can have episodes, especially if those black barrels are resting in the sun. The whole barrel is full of paint, so there is plenty of mess to be made when it gets into a mood. I have since gotten two more that were at a steep discount and two metallic colored ones made by Kuretake (bottom two), also steeply discounted. These metalic ones have actually been rather fun. They have a slightly smaller brush, but are otherwise fairly indistinguishable in construction. They have a ball in the barrel to help mix the paint, probably due to the nature of metallic paint, which does lead to another chance of mess when shaking. All of them are too long to fit comfortably into many pen cases for carrying, but they need some protection to keep the lids from getting knocked off. I ordered the actual Pentel Pocket Brush Pen (top) and was instantly thrilled by it. This is just plain fun to move around on a piece of paper. The tip is a very nice size. I can get tiny lines and fat lines and vary between without picking up the pen or going back over an area. I can lay it on the side to get a spotty fill, or fill it in a deep black. It even comes with a very nice ink that is almost entirely water resistant. It takes a cartridge instead of filling the barrel and seems much less prone to various spills. As it has aged, it has become very susceptible to wind and even light breezes. Air movement will cause bristles to come away from the bulk of the tip. I have since ordered a Kuretake No. 8 Fountain Brush Pen, which has a shorter brush tip for a little more control. It is also a cartridge pen and has a bead that is pocked into the cartridge when it is used. It is too long for comfortably placing in my pen case, like the Color Brush Pens. I haven't used it much yet, my Pentel is still my go to pen, but this one has worked fine on a couple breezy days. I'll probably have more to say about it when I'm starting on my third cartridge, at least, but for now I haven't even finished off the first. I haven't even tested the water solubility of the ink yet. Of course it is nice to have colors, lots and lots of colors. To that end, I also got some water brushes. 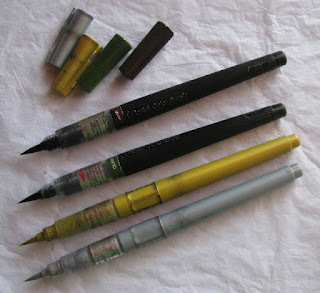 The ones available at the time were Kuretake and they are very much like the color brushes in construction except they don't come filled with anything, the brushes come in three sizes of rounds and a flat, and they come in a compact size that is much easier to fit into a pencil case for carrying. I got one of each size of the rounds. The small one turns out to be similar is size to the brush pens, the medium very like the watercolor brush I first got, and the large tends to stay at home since it is just too big. I also made a watercolor pallet in a Celestial Seasonings tea bag case with some ultra light Sculpey. The best idea I have seen for this size since is 2x2 Lego blocks upside down. I now have even smaller pallets in fuse boxes. In actual use, it turns out I do not like the water brushes. They are continuously washing the paint out of the brush, so I am constantly having to get more paint on them. It is difficult to get anything very heavy with color. It is, of course, impossible to do any dry techniques. 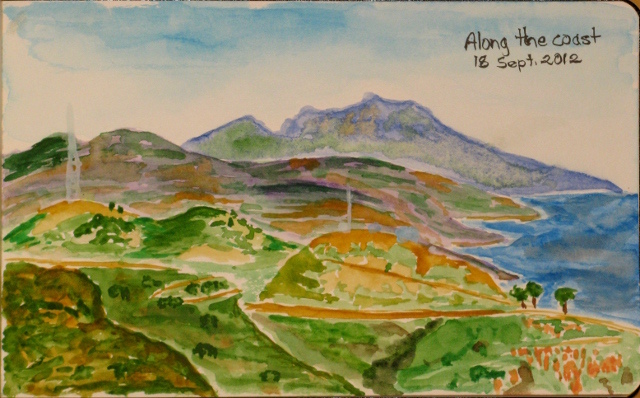 There are not a complete failure, but for watercolor application, I have replaced them with travel brushes. These are brushes that have a cap to protect the bristles that becomes part of the handle when in use. I ordered Escoda brush that came free with a watercolor book (I actually thought if it the other way around, and got a size 4 instead of the 2 specified) and a Da Vinci Maestro size 3. The travel brushes aren't much cheaper with synthetic bristles, so I went ahead and got my first sable brushes. I definitely like the feel of the Esconda brush better, although this may partly be because it is thicker. They are fluffy when dry, as in the picture, but when wet come to beautiful points. The Esconda seems to come to a point a little better too. When capped, the Da Vinci can fit into my paint cases. The Da Vinci has a hole at the end to help with drying. The Esconda has no hole, but seems to dry out eventually even when capped. The Da Vinci is much lighter as it is plastic construction while the Esconda is brass. With my return to traditional brushes, I also need something to hold water. I got a set of snap together kid's size dishes that were on closeout at REI and take the cup with me. This folds flat and weighs little more than an ounce. It is generally sufficient to put about a centimeter worth of water in the bottom of the cup for painting if I am using my precious drinking water. If there is something nearby, I'll scoop out a whole cup worth for use. A brush full of color is still a bit attractive, and so I have found use for many water brushes. After all, I can get them in a brush size I like better than the Color Brushes and in a length that is easier to pack. Since they come empty, I can fill them with just about anything I like. I have collected a few of them now and filled them with ink. They aren't perfect but are certainly fun. They are more prone to messes than the brush pens with cartridges, but I have sorted out better how to not allow that to translate into blobs on my paper. Pressure changes can be a big problem. The lid keeps in whatever pressure they were at, but once uncapped, it can squeeze ink everywhere. Now I always uncap them held away from my paper and with the brush upward. Usually, this means air is squeezed out when the pressure is lower than when it was capped. Sometimes it still pushes out ink because the upper section has filled with ink. My blue tends to do this. 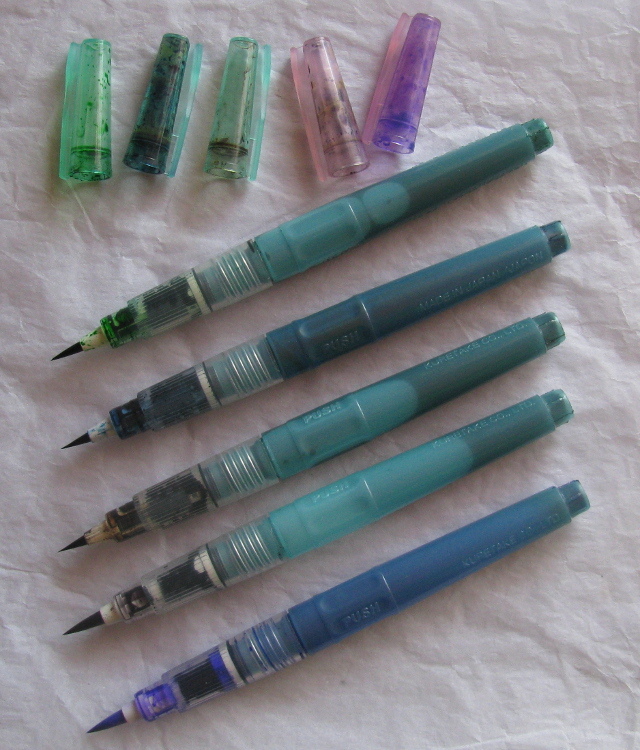 They also tend to be a bit too heavy with ink, but this also depends on the paper I am using. I suspect they would be less unruly if I hadn't filled them so full with ink and instead only put in 1/2 or 1/3 of the barrel. I don't use it so quickly that I need more than that and it would be lighter for carrying as well. Ah, paper. The other side of the equation. 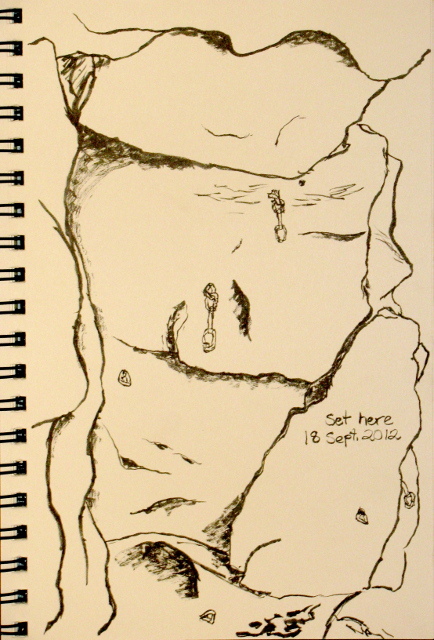 My first sketchbook was something I bought in high school and used two pages. The paper is something somewhat heavy and toothy and I quite liked it. It is not quite thick enough to use both sides without seeing the picture on the other side, so I only used one side. 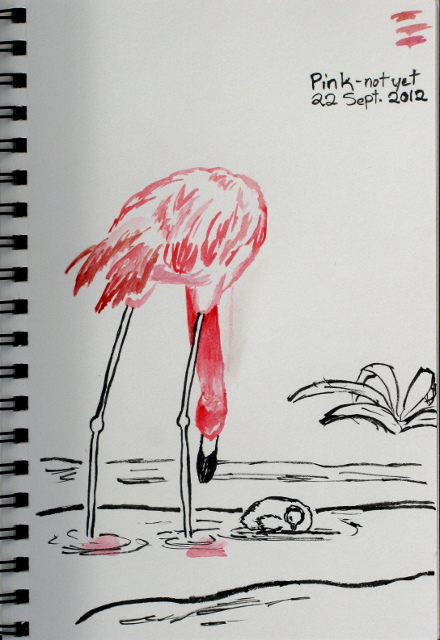 Then I had one of the ever popular Moleskine sketchbooks. This paper is thin and I can see through it to the sketch on the next page. It also feels a bit waxy to me. Watercolor beads on it and takes forever to dry. My inks are more likely to feather on it and the brush is always too heavy with ink for it. Even if it bleeds through, it tends not to get onto the next page, but sometimes there are dots. I have a Moleskine watercolor book, also. This is nice and thick. It stands up to some fairly wet moments without too much warping and could probably stand up to using both sides, but I still don't do this. I tend to think my results when using this book are a bit muddy, but I don't blame the paper for that. I also currently have a Canson Field Drawing Book. For sketching, this is where it's at. Most sketchbooks have paper in the 65 lbs range, which is just a little bit too light weight for putting a little watercolor on. This is 80 lbs paper and works brilliantly for all my sketching desires. And it is wire bound to make it easy to deal with. So that's much of the story so far with sketching supplies. I've been eyeing some other sketchbooks. All at least 80 lbs paper, but one with a non-white paper that I could use with a white ink. There are some other brands of water brushes I might try for holding ink, although the reviews would seem to imply I'll have more problems with too much flow to the brush. People seem to think the ones I have require too much squeezing although I personally never find need to give them a squeeze. I am not holding them at the barrel so it isn't that I am squeezing them unconsciously. 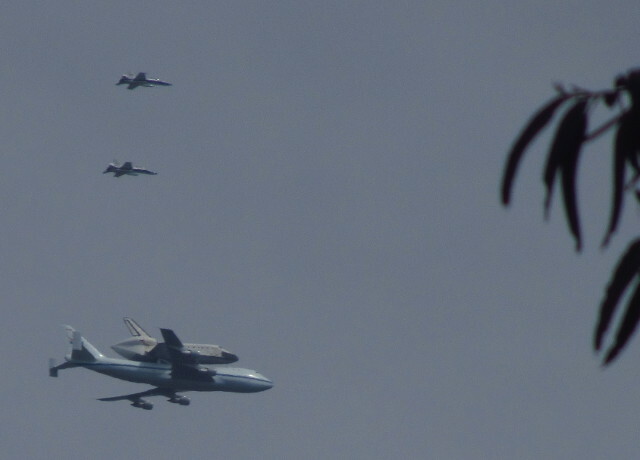 The space shuttle Endeavour on its very last flight ever is set to take a very long route from Edward's to Los Angeles heading all the way up to Sacramento and San Francisco, which are not exactly on the way. It is also hitting Vandenberg, so it seems it must go right overhead on the way. 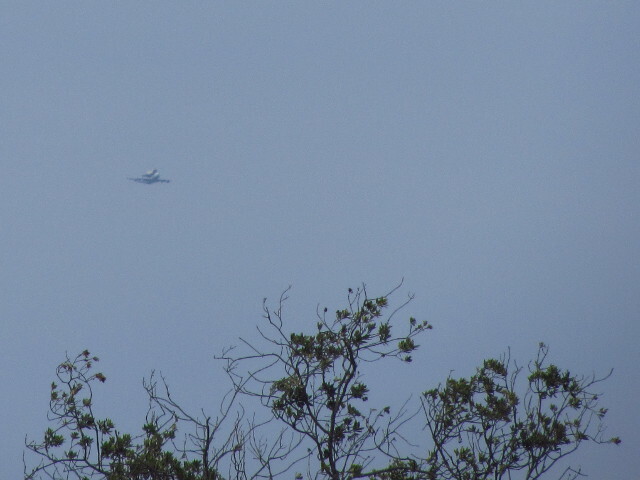 Already late for the Vandenberg flyover, I head down to Shoreline Park for that extremely open sky for the maximum chance of seeing it. It's already been delayed a bit worrying about fog in the bay area, so I'm not expecting it to be anything like on schedule. 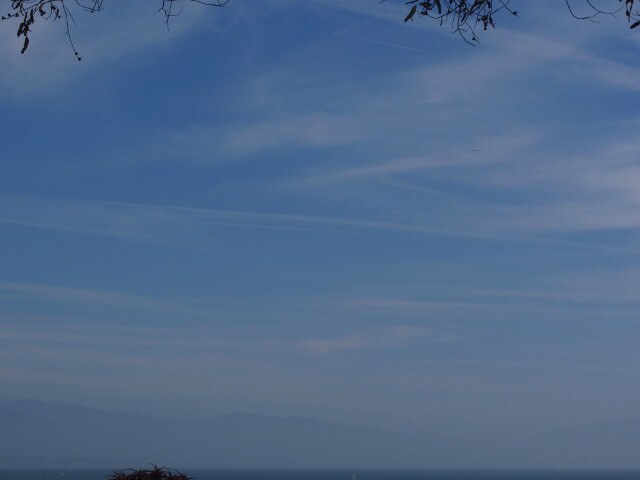 Getting to the park, I take a very casual stroll along the cliff. There's not many people in the park, but there's a few who are suspiciously scanning the mountains instead of the usual ocean facing behavior. There's quite a few paddle boarders out in the ocean as well. A guy who has been talking on a phone and poking at an iPad heads over to a group and informs them that it'll be about 10 more minutes. Fog is making some minor attempt to move in from the west, but it isn't too bad. I find a nice spot to wait and wait for something to appear on a funny flight path that's a bit too low. It seems like a while, but not that much later, I spot something suspicious. Zooming to that full 14X, I snap a photo of the grey spot, then zoom in on it in the camera display to prove that this is indeed what I'm looking for. I get to say, "Yes, that's it!" to the chorus of, "Is that it?" erupting around me. 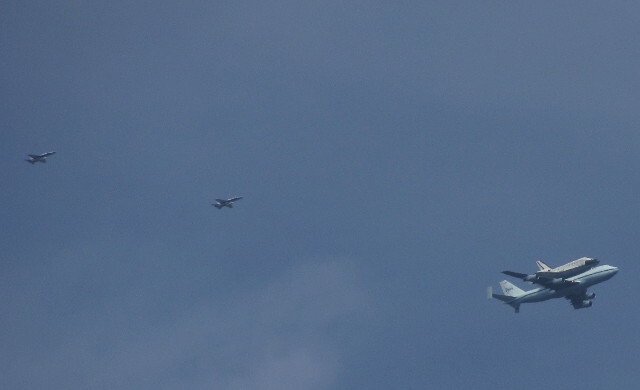 It really is flying low and we all get a good view as we try to experience and document at the same time. Does it usually have a couple fighters chasing it? 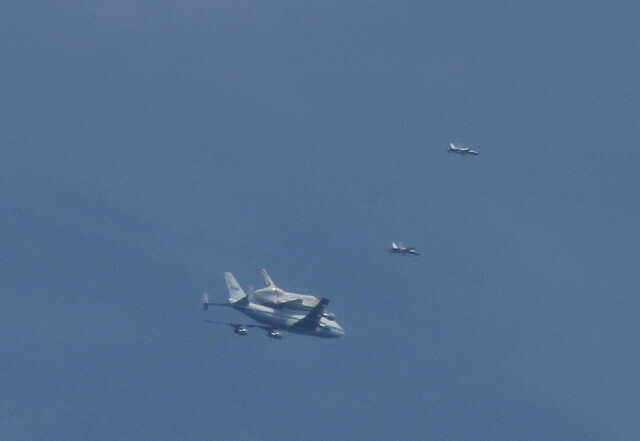 They're the source of a live feed folks can watch of the shuttle traveling, which is how I knew to expect the flight to be unusually low to the ground. We really do get a good look at it as it goes past. 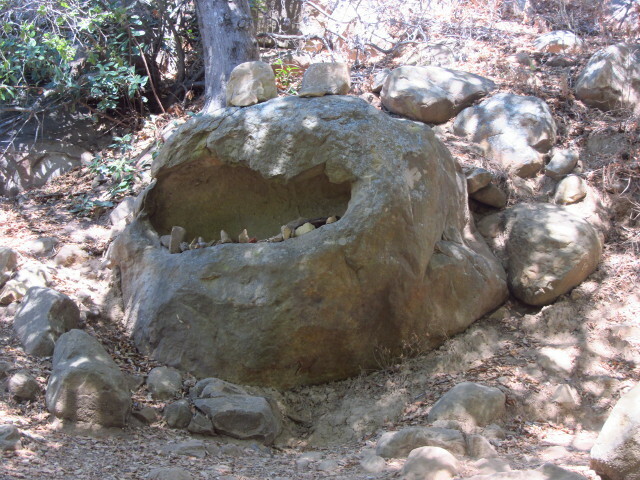 The Rattlesnake Canyon Trail starts at Skofield Park and reaches into the National Forest behind before popping up on Gibraltar Road. A connector runs from it over to Tunnel Trail, so routes to the top exist by either the road or the trail. I decide to head up it thinking I might go to the road, which has a good view of the city but the air has been hazy for weeks. I might go up to Mission Fall but it is as dry as always since it takes more even water to flow than cleaning up the haze requires. I might just poke at things. I find a place to park on the east side of the one lane bridge at Skofield and drop into the dry drainage along some use trail to cross over to the big sign where the trail presumably starts. 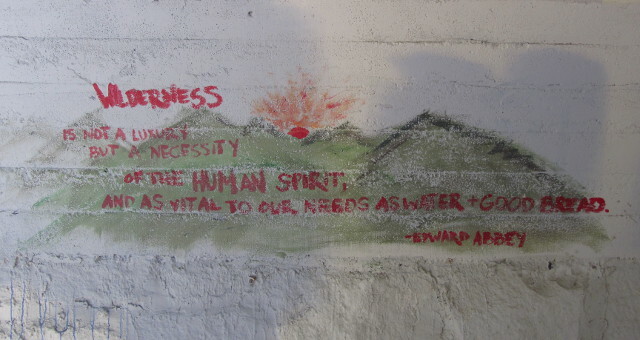 I found some graffiti under the bridge at Skofield Park. I turn up the trail and soon cross over flowing creek and climb along a couple switchbacks with multiple deep shortcuts to a good trail at the top coming from the east side of the creek. The trail stays high on that bank for a bit, passing an old driveway with a small trail and stout wire marked "no trespassing" to hint that it isn't for the general public to follow. A little further, there is a second route to the right that is well traveled and likely goes to a ridge that is popular for the view. I skip both these and keep going up. For some reason, I want to shout out, "Cookies!" One "hike" that is sure to find a lot of animals is a trip to the zoo. Now set up so that you enter through the gift shop instead of hiking up the hill beside the swans, but there are no animals along the new entry route unless you count the microscopic pond scum that is being cultivated. We spot some cute and very furry new world monkeys with a sign saying they can't really grasp things with their tails. The greatness of the new world monkey tail shattered so callously! Not a good start. 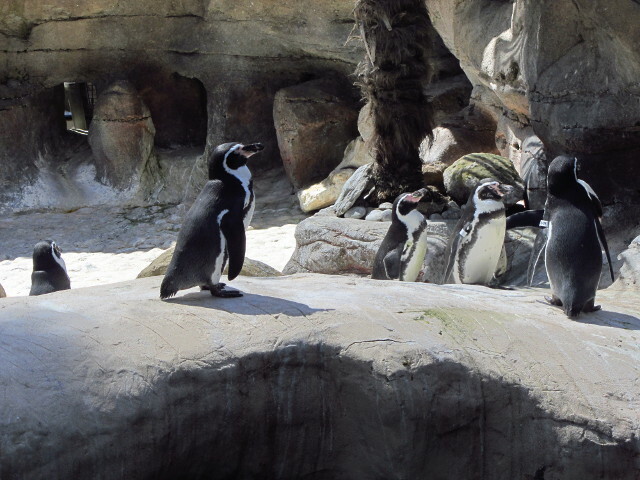 We head over to the elephants, who are determined not to do much of anything in the day's heat, then turn to the penguins that have replaced the sea lions. A few of them are determined to do quite a lot of swimming. The icons that indicate the predicted weather all turned to thunder storms the day before and were now promising rain, as was, if I'm honest, the sky. 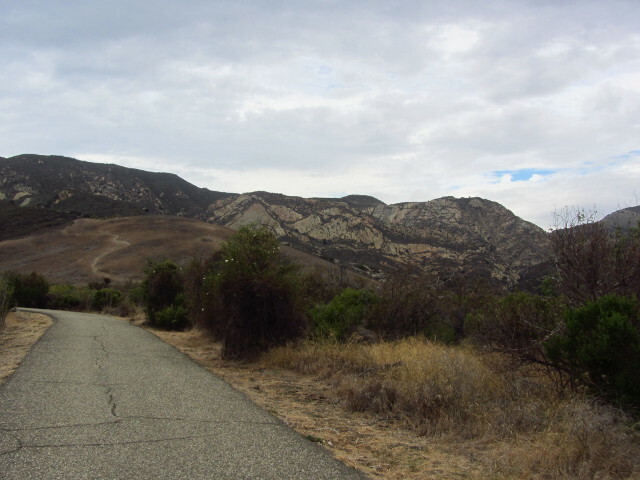 I drive toward the south end of Gaviota State Park, and right into the rain. Nothing particularly hard, but definitely rain and not mist. I drive out the other side of it, too. Strips of blue sky can be seen out over the point, but not quite in a way that implies clearing. It is dry as I start down the paved fire road that starts off the route to the wind caves. Starting off down the paved fire road, the trail twisting along the hill beyond. A few small paths lead through the thick growth beside the pavement and up the hill, some heading back to the main road and some heading up toward the ridge. They are likely to be deer trails, at least originally. Eventually a large path leads through the growth and I turn down it. It snakes up the hill in a way that is a bit too steep because the switchback shortcutters have won on this section. It quickly comes into chaparral, where it should be harder to cut the switchbacks, but people have and they are winning here too. It does not help that the soft sandstone has become a rut and a water path where the trail first went. Now trails follow beside it and across spaces. Some sandstone caves on the ridge. 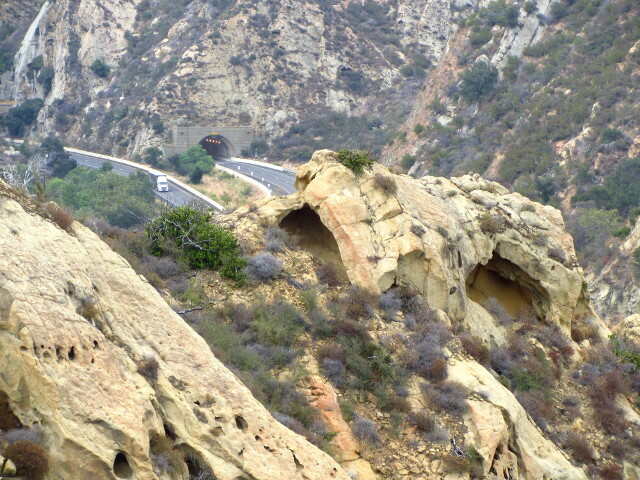 This is how big the natural caves are, any larger caves are man-made like the Gaviota Tunnel behind it.